Sarah Waldron holds a BFA degree from Washington State University and a MFA with distinction San Francisco Academy of Art University. She has worked as Art Director and Designer on staff for Vandyke Company, Seattle; Art Director and Designer on staff Primo Angeli, and S&O Consultants, San Francisco; and has been a Faculty Member, San Francisco Academy of Art College. In 2005 she was invited by special invitation to be a part of the 2005 Biennale Internazionale dell’Arte Contemporanea Città di Firenze – Italia. This is an international show in Florence Italy held in the Fortezza de Basso in collaboration with the United Nations, the Biennale is also an official participant in the “Dialogue among Civilizations” program. Artists from all over the world are invited or juried in by merit. In collaboration with the United Nations, the Biennale is also an official participant in the “Dialogue among Civilizations” program. The artist subjects represent pattern, movement, texture, color and graphic elements. The paint is applied in a thick manner and from an angle the paint creates almost relief texture on the surface. Although her paintings are textural and abstract at close range they materialize as the realistic subject when the viewer steps back. 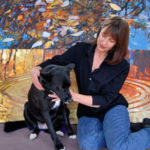 The artist describes her paintings as Abstract and Impressionist Realism. Sarah Waldron’s paintings are in corporate and private collections throughout North America and on Television sets such HBO series “Six Feet Under” and “Jack and John” a 2008 series about the Kennedys.